Elena has captivated audiences in concert halls around the world such as Germany, Austria, Albania, Poland, Switzerland, Spain, Brazil, Japan US and Russia. As soloist she has performed with orchestras including the Budapest Chamber Orchestra and UCS Orchestra-Brazil, Scarlatti Orchestra, Cremona Soloists, Albanian Radio Television Orchestra, Catania Orchestra, Sicilian Symphony Orchestra. Her 16 recordings for Edipan Ricordi-Stradivarius, Bayer Records, Classics Talent Records, Tactus Records and La Bottega Discantica have been awarded with the highest tribute in important International Music Magazines and are broadcast on radio stations worldwide. 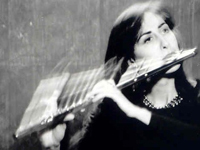 She was Principal Solo Flute of the Sicilian Symphony Orchestra until 1994 and also performed as Principal Solo Flute in the Orchestra of Venice, the Toscanini Orchestra of Parma , Theatre Orchestra" of Vicenza, Philarmonic Orchestra of Piacenza, and the Classical Orchestra of Alessandria. Elena is Professor of Flute at the Conservatory at the University of Genova and has taught Masterclasses at Valtidone International Festival Assisi, Castellina Marittima in Pisa, Music Academy in Vicenza- Italy, Liszt Music University in Weimar, Music Academy in Krakov, Florida State College in Jacksonville, Southeastern Louisiana University, Loyola University and Tulane University in New Orleans, Northern Illinois University in Chicago, and at the University in Porto Alegre-Brazil. She attended masterclasses at the Mozarteum of Salzburg with K. H. Zoeller and at the Hochschule für Musik of Vienna with the flutist W. Schulz and E.Melkus for Baroque Music and graduated in Italy at Conservatorio of Frosinone with the highest marks under the guidance of A. Pucello. Elena is Magistral Dama of the Knights of Malta and she is a musician of Donatori di Musica. She is a Haynes Flute Artist and she plays a Haynes gold flute 14 K which belonged to the famous Italian flutist Severino Gazzelloni.